This pristine 2013 modified Regent makes a grand statement. Great mountain views, high volume ceilings, a large open Kitchen & Family Room w/breakfast area, spacious Living & Dining Rooms & many upgrades. 2 casitas, one large, one small, each with their own bathroom, & 3 interior en-suite bedrooms. 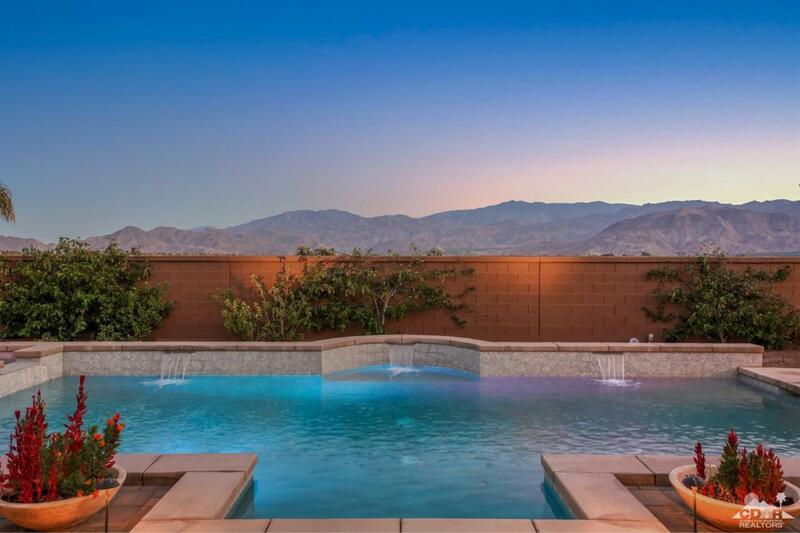 The backyard is an entertainer's delight with an over-sized swimmer's pool & spa, fabulous mountain views, a large grass side yard & a lovely gazebo. All on an oversized lot of approx. 1/2 acre. The chef's kitchen showcases an island, Bosch Energy Star Appliances, an SMEG 48 Opera Series Professional Chef's Range & Hood. Massive spaces & tile floors throughout (except in master bedroom closet). Cherry Thermafoil cabinets, upgraded baseboards, upgraded granite, built-ins, custom window coverings, 2 fireplaces, a covered courtyard entry w/6 skylights and a large covered patio. Within the more reasonable IID utility district. Gated with low HOA dues. Backup offers encouraged at this time.